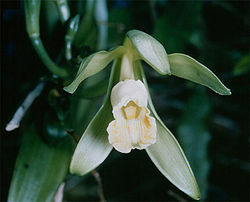 Wikimedia Commons has media related to Vanilla planifolia. ↑ Janet Hazen (1995). Vanilla. Chronicle Books. ↑ "FAO's Statistical Database - FAOSTAT". 2011. ↑ "Rainforest Vanilla Conservation Association". RVCA. Archived from the original on 2009-06-24. This page was last changed on 31 August 2017, at 14:23.